Iceland has been on the rise as the new haven for quality underground metal. In the traditional spheres Angist is slowly making a name for itself on an international level. 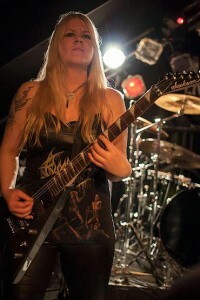 Angist, the death metal unit centered around Edda Tegeder Óskarsdóttir (vocals, guitar), and Gyða Hrund Þorvaldsdóttir (guitar), who are based out of Reykjavík, and formed in 2009, debuted in 2011 with the “Circle Of Suffering” EP. “Circle Of Suffering” draws mostly from American genre pillars, and Óskarsdóttir’s vocals sound somewhere between John McEntee (Incantation), and Corinne van der Brand (Acrostichon). For being around only a meager three years Angist is both musically, and conceptually more complete than some other established institutions, although what they do is hardly innovating. 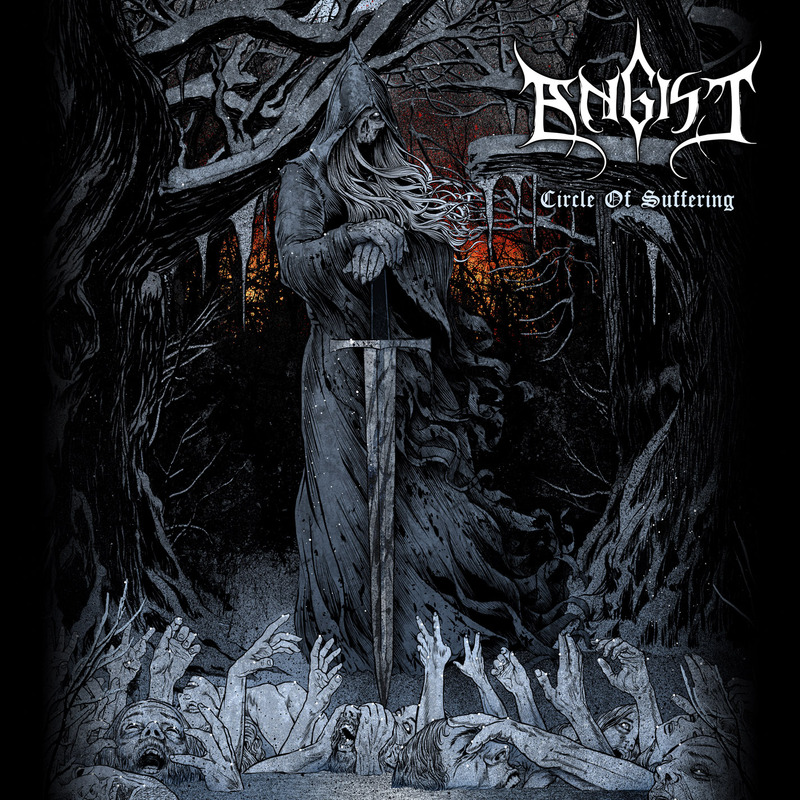 As far as pure death metal goes, Angist is among the stronger acts in what is otherwise a genre oversaturated with trite one-off projects and soulless knock-offs of the more popular brands on the market. ‘Circle Of Suffering’ starts out like a melancholic Incantation song, and has some very strong solo’ing. Likewise there are plenty of sorrowful melodies and harmonies through out ‘Godless’. The track sounds like the middleground between an old Death and Incantation song more than anything else. ‘Silence’ starts out with a semi-acoustic buildup that’s almost doom-like in its construction. It is reminiscent of My Dying Bride circa “As the Flower Withers”. ‘Unwelcome Thoughts’ sounds like an old Immolation, or an early Death song. 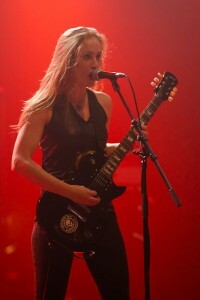 ‘Death Incarnate’ is the best composed, and the most technical song of the EP. ‘Rotten Mind’, the first song that Edda and Gyða wrote together before Angist became a full band, is probably the fastest song on the EP. The EP is concluded with the two tracks of the “Promo 2010”. As expected there’s a notable difference in production with these last few earlier recorded tracks. Interesting is that each of the new tracks ends with some kind of spooky sound effect. ‘Our Ruin’ is by far the most thrashy of the EP, although the second half in general is more death/thrash-oriented than the first. On the whole “Circle Of Suffering” sounds a lot darker, and morose than most contemporary outfits in this genre, and that’s a definite plus for Angist. It’s the band’s unwillingness to compromise its vision that makes its more resonating than its more marketable, and easily forgotten, peers. While Angist sounds a lot darker than its sterile contemporaries they don’t yet reach the same level of malevolence and dread that made many of its classic inspirations the household names that they are. It would be encouraging to see Angist evolve into a musically more rancourous and brooding entity. That Angist evolved from a death/thrash unit into a death/doom metal one would reasonably suggest that Angist aims to write even darker and evil sounding songs in times to come. Regardless of their future plans “Circle Of Suffering” is a strong debut EP. “Circle Of Suffering” was recorded, mixed and mastered at Emissary Studios in Reykjavík with Stephen Lockhart producing. The EP comes with a concrete, bass-heavy production that is both crunchy, and clear. Notably is that the drums sound tonally organic, and aren’t overly processed, or triggered. Thankfully, the often ignored bass guitar is clearly audible during these wildly dynamic cuts. The studio appears to be a focal point of the scene, and earlier produced records of Svartidauði, Sinmara, Ophidian I, Rebirth of Nefast and other Icelandic metal bands. It is a fitting production for a band whose primary influences include the early works of Immolation, Incantation, Death circa “Human”, and to a lesser degree Doug Cerrito-era Suffocation. Both the logo, and the stunning artwork by Christian Sloan Hall is atypical for the genre’s more contemporary variations, but otherwise fit very well with the traditional niche that Angist calls home. Originally released independently in digital format, later picked up by American label imprint Abyss Records for North American distribution – and finally re-issued by Dutch label Hammerheart Records for the European territories as an EP in 2013. Additionally there was a band-approved cassette tape re-issue of “Circle Of Suffering” by Malaysian label imprint Narrowards, including the “Promo 2010” as bonus content. In all “Circle Of Suffering” is a promising debut for a young band on the verge of unlocking its true potential. Traditional in design, but modern in execution Angist is one of the few to remember the genre’s defining traits, and that controlled hateful aggression through superior songwriting is far more enduring than senseless wall-to-wall brutality. Hopefully we’ll see Angist further explore the doom – and death metal aspects of its sound in future material. As of right now “Circle Of Suffering” is a commendable start.